Dr Buthelezi is a seasoned public health medical practitioner with more than 15 years’ experience in health governance, policy and programme management. 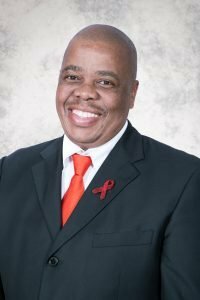 After serving as a clinician and later Medical Superintendent in various hospitals in KwaZulu-Natal and the Free State province, he served for 10 years as KwaZulu-Natal’s provincial head of Strategic Health Programmes which encompassed HIV, TB, maternal child and women’s health, nutrition and communicable diseases programmes . Before joining SANAC, Dr Buthelezi had been South Africa’s Country Director for ICAP at Columbia University, which is a division of the New York-based Mailman School of Public Health since 2014. Prior to this, Dr Buthelezi worked as the Senior Technical Lead for the DFID-funded SARRAH programme which was implemented by Mott-McDonald supporting the health reforms in South Africa.